Even though marketing is designed to get people to change their behaviour, marketers themselves are incapable of change, with budget still on traditional channels and throwing money at marketing instead of making the mediocre product better. At least, that’s the view of Andy Lark, chief marketing officer at accounting software company Xero, speaking at the Daze of Disruption conference in Melbourne this morning. Pulling an example of a patient and a doctor, where the patient is living an unhealthy lifestyle and needs to change otherwise they could face a potential life-threatening incident, the majority of patients don’t change. Lark likened this to marketers. “We choose death over change!” he exclaimed. We’re in the change business but largely incapable of change ourselves. The marketing spend is a gripe for Lark in this non-changing environment, as many budgets still throw a lot of dollars at the traditional channels. When asking about data, he said the response is “oh yeah, totally”. And digital? “All over it.” And then he asks to see their budget. “Inevitably, 80 per cent of the spend… is in old world deployment,” he said. 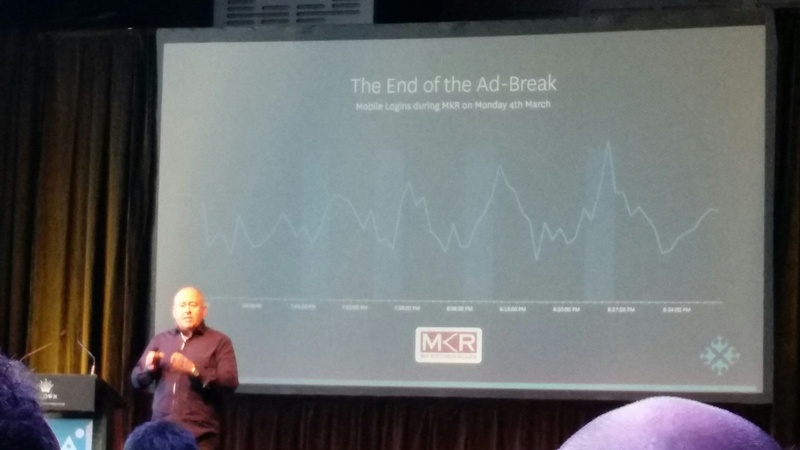 When it comes to TV, Lark declared most people just don’t watch the ads, bringing up some data from the number of mobile logins people had while watching an episode of My Kitchen Rules. This leads to Lark believing “marketing is propelling us towards obsolescence”. And products themselves are what needs to be focused on, not throwing moolah at marketing in the hope it will help a bad product. It’s an area Lark touched on at Daze of Disruption in Sydney earlier this year, questioning whether marketing was just a veil for a rubbish product. “Marketing, largely becomes a crutch for product mediocrity,” he told the audience this morning in Melbourne. “Largely we’d rather spend on marketing, than fixing our core product. “We as marketers are so focused on the wrong thing, we’re focused on media, creative and that sort of stuff, we’re forgetting the heart of what we do is products and services. Great FMCG (fast moving consumer goods) brands get that, he said, technology brands get that, “but in most places, marketers have nothing to do with the product”.